Glenda commented, "Loyd found some of the original napkins from their wedding. 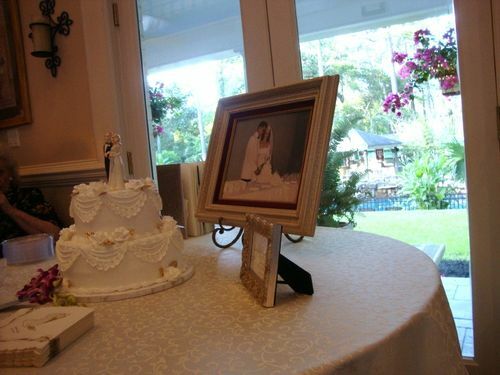 That's a picture of the napkins with the flowers and one of their wedding photos on the table. Loyd also reminisced that it had been so hot at their wedding that the candles melted. True! " Laura added this information, "The cakes were similar, although the 50 year celebration cake was made by a local Pearland Bakery." She concluded, "I really appreciate Glenda taking these pictures and having them posted for us."